WordPress is a very powerful blog posting and website content management system. It is free and open source which has proven its worth in being one of the best website creation tools with little prior technical experience. Anyone can use WordPress and create a website within minutes. 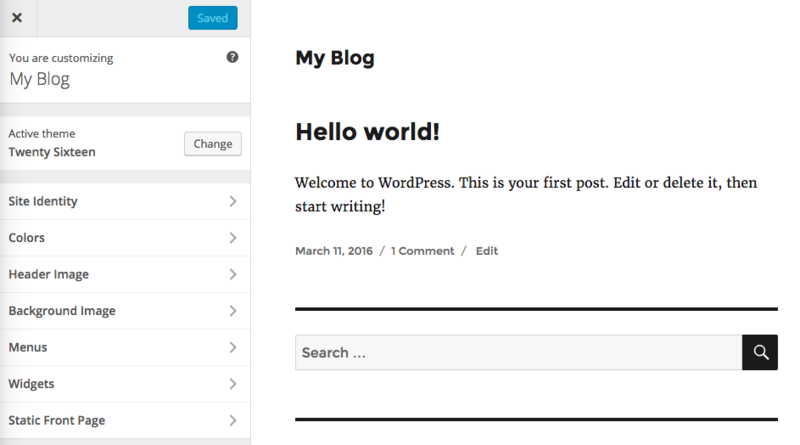 In this article, we'll discuss how to get started with WordPress and understand the basic functions that are available to use. 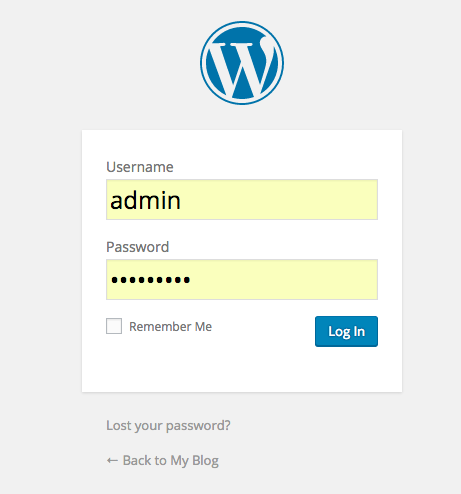 If you already have WordPress installed on your website, you can usually access the WordPress admin panel by adding '/wp-login.php' to the end of the website address. However, please note that if during the installation process you have chosen to setup the admin panel in a different location, you will need to type that instead. If you are unsure, check back to the email you received after completing the installation which should include all of the relevant information. To access your admin panel, type in the username and password that you again setup in the installation. Once you have logged in the admin panel, take a glance down the left hand side menu. Straight away you can see that the 'Dashboard' is highlighted blue which is the current position in the admin panel. Further down there are additional menu items that include 'Posts', the section to create new blog posts, 'Media', the section for uploading new photos or videos, 'Pages', the section for creating new content for the website and 'Comments', the section that holds any comments that your blog posts or pages have received comments from visitors on. More intermediate sections follow that include 'Appearance', for customising the WordPress look and feel, 'Plugins', intended for adding any extra functionality to the website, 'Users', records of those with access to the site, 'Tools', for import and export requirements, and 'Settings', set from the installation but they can be changed again if need be. It was mentioned earlier that the dashboard was the current page that was shown. This is the page that you will normally see when first logging into the admin panel. The dashboard will summarise the website as it currently is and provide some helpful links. Straight away we can see that WordPress has compiled some useful options to customise the site. It is encouraging the first blog post and offering the option to add a new page, such as the 'About' page. Selecting the option to 'Write your first blog post', we can see what is required when doing this. 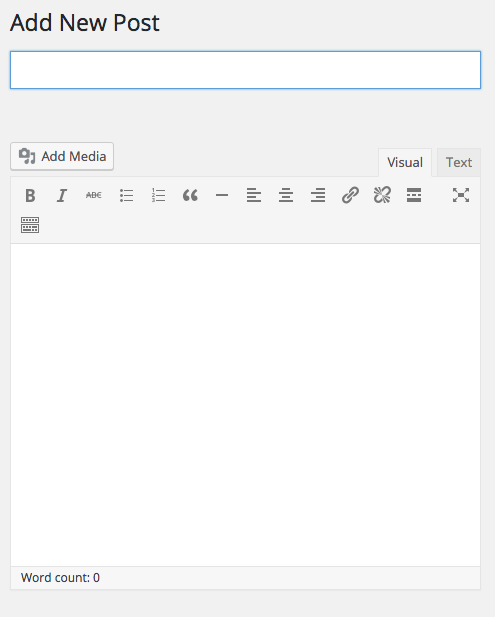 WordPress is asking for a title for the new post and offers a decent sized text area for the blog post information to be written. If we take a little closer look at the menu, there are a number of formatting options available that are similar to what you would see using email or word processing software. The typical options are bold, italic, underline and alignment. 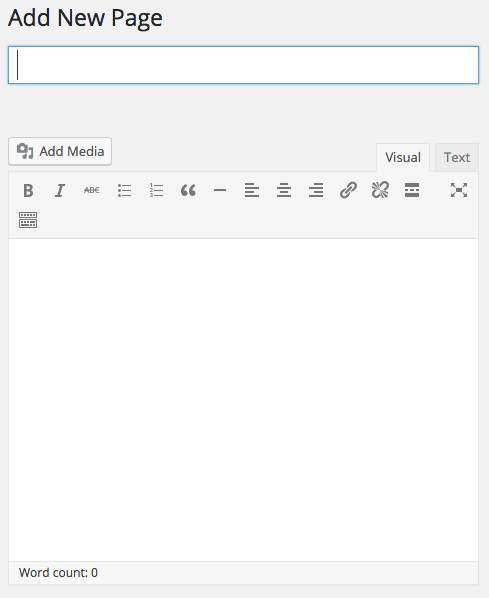 WordPress provides you the option to publish a new post immediately or save it for later. If you are half way through writing your blog post, you can simply save it as a draft and carry it on later using the 'Save Draft' option. Want to see how so far it is looking? You can choose the 'Preview' option to do that. Happy to go ahead to post your first blog post? 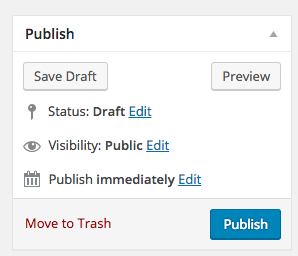 Be brave and hit the 'Publish' option. The blog post will go immediately live on your website for your visitors to see. If you change your mind, there's a 'Move to Trash' option. If we take another look at the dashboard, the prompt to 'Add an About page' takes us to the section to write a new page. How does that look? As you can see, it's almost identical to what we've seen before when you add a new post. Adding pages to your site can help provide information to visitors and plays an important part of the core website structure. Again similar to writing a new post, the publish functions are the same. You can draft, publish or trash any page according to your needs. The ability to change a website's appearance is an important element. You want your website to stand out and advertise you as best that it can. Referencing again back to the dashboard, the 'Customize Your Site' option gives easy access to this. If we scan down the left hand side menu, there are many options offered to set the 'Site Identity', 'Colors', 'Header Image', 'Background Image', 'Menus', 'Widgets' and 'Static Front Page'. You can invest as much or as little time as you like in these options, tweaking what you feel is right, seeing the changes come live on the right hand side preview. Making these changes inline couldn't be easier. In this article we've discussed the very basics of WordPress and the functions that are available. It's important to understand that anyone can create a website in WordPress. No prior technical knowledge or understanding is needed, as the options are very clear and very user-friendly. If you've not already, take the plunge and start using WordPress today!